Grow your own evil mega-corporation and rule a cyberpunk world. Spinnortality is described as a cyberpunk game but instead of fighting an oppressive society dominated by computer technology, you create the evil megacorp that takes over the world. 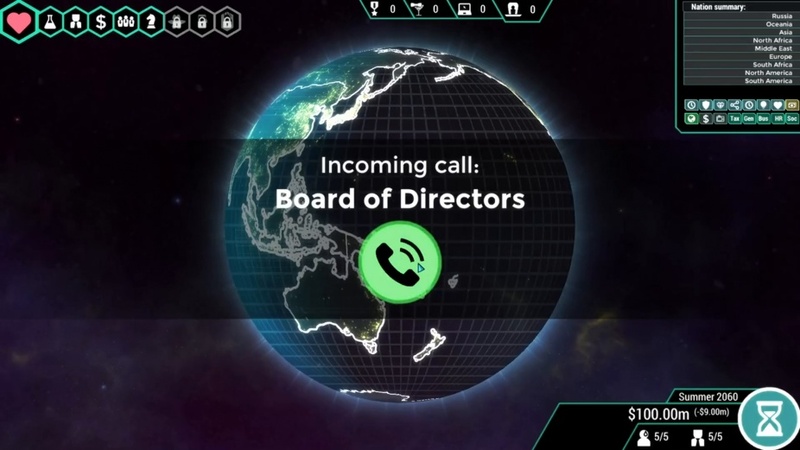 At the start of this strategy game, you are given leadership of a giant corporation. Although leadership might be overselling it: you are still a puppet that is directed by 'the board'. The board gives you objectives you must complete within the time they set. If you fail to do so, you will lose board approval - when your approval rate drops to 0% you will be fired and thus lose the game. Luckily your objectives are relatively easy to obtain - if you don't mind playing dirty, that is. Your main goal as a corporation is, of course, to take over the world with your products: you have nine nations (Russia, Oceania, Asia, North Africa, Middle East, Europe, South Africa, North America, South America) to pawn your products off on. Each turn takes you six months in the future, and every turn you get to decide which product to launch where. Your focus is on social media: you want people to connect with each other, but mostly you want them to connect because it gives you income, information and influence. The products you are selling are each more awful than the other: starting with simple social media it quickly dwindles down when you bring out products that spy on your users to track their entire lives. Besides social media, your megacorp has another goal: immortality. The board urges you to research techniques such as brain transfers in order to eventually obtain eternal life. In order to do so, you must make a lot of money to fund these projects, but mainly you must convince every nation to approve and get involved with products that are ethically questionable - if spying on your users wasn't bad enough, what about meddling with their genetics? Every nation has different values: a nation with strong human rights laws will not allow you to launch any product that is in conflict with human rights. Want to release a bot that buys stuff without permission of its user? Think again. But you wouldn't have become a huge megacorp if it wasn't for some good old corruption: you can bribe politicians to loosen up the laws. You can buy media shares to influence the population of a nation, making them more likely to approve of the products you promote. Another downside about working with AI and 'mutants' as they are labelled by co-workers, is that it causes friction and hightens worker happiness (and thus their efficiency). As your corporation is nothing without banging out products, it is vital to keep your employees happy. Another big point to keep in mind is public opinion: nobody would buy your product if they knew too much about your corporation. Therefore, keeping your reputation clean is important for your corporation as well. At almost every turn in the game you get prompted to make a decision for your corporation: this can range to going green to supporting a nation in need of aid. Depending on which decisions you make, the public opinion will rise or fall. However, sometimes you simply don't have the funding or connections to make the decision for most optimal outcome, which keeps the game interesting throughout. Money means power. But besides money, connections are of great importance too. Besides buying media shares and bribing politicians, you can also choose to fund any (or all) of three schools which will grant you benefits: not only does the public opinion of your company improve, you also get connections with the army, skilled hackers, and high society. All of these connections are of great value: they will come in handy when you start working on your hidden agenda. In the hidden agenda tab, you can choose one of (or all) four ways you can work your way to ultimate power: through army, education, media, or, the most morally correct one of all: you can regrow the world into a better place. The more points you unlock in the hidden agenda, the more power you will gain in the world. And if the world isn't enough, why not expand to the moon? Whilst the army comes up often, no nation ever goes to war. In fact, the nations don't interract with each other at all. Due to the fact you are already micromanaging a lot, this feature isn't sorely missed. The UI is clean - it feels like a spreadsheet, giving you the idea you are indeed at the head of a company. At first, it can seem a bit complicated, but you will soon get the hang of it. There are three game modes, where easy lets you start with a large start-up sum and difficult let's you build from scratch. The tutorial walks you through the gameplay when you need to continue to the next step, meaning you aren't overwhelmed with too much information at the start. The pace of the game gives you enough time to plan out your strategy - will you dominate the world or leave the world a better place? The random events and prompts keep the game interesting throughout. Multiple endings are possible, therefore replay value is high. We have lost the game two times (once we got fired by the board, then we died of old age) before we successfully dominated the world with our unethical products, and even turned the moon into a giant billboard. Spinnortality makes it feel good to be bad. For the low price, you get more depth than you might expect, high replay value, random events keep the game interesting. The menu takes a bit to get used to, nations do not interact with each other, sometimes you're just waiting turns because there is no research/events to be done.